Own One Foot In The Grave Christmas Special DVD from Deff, DVD, Blu-Ray & 4K Video Specialists - Free UK Delivery..
Own One Foot In The Grave Complete Series 1 to 6 DVD from Deff, DVD, Blu-Ray & 4K Video Specialists - Free UK Delivery..
Six episodes from the popular BBC sitcom based around the professionally grumpy Victor Meldrew (Richard Wilson). In 'The Return of the Speckled Band', the Meldrew family holiday is fast approaching and something rather slippery is invading their residence. In 'Dreamland', Victor is determined to look good when the woman from the coffee advert comes to open the village fete. In 'The Broken Reflection', Victor's brother comes to stay and ..
Own One Foot In The Grave Series 1 DVD from Deff, DVD, Blu-Ray & 4K Video Specialists - Free UK Delivery..
Own One Foot In The Grave Series 2 DVD from Deff, DVD, Blu-Ray & 4K Video Specialists - Free UK Delivery.. 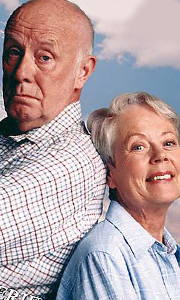 The third series saw Victor Meldrew and the regular victims of his chaotic retirement settled as an essential part of the nation's viewing. Around 16 million viewers would regularly witness the Meldrew principle in full flow: whatever can go wrong always does and usually it spells disaster for Victor. "There's a bloke we can't stand any longer... always on the bleedin' moan. Every time we mend his bloody Honda... he's back grousing on t..
Own One Foot In The Grave Series 4 DVD from Deff, DVD, Blu-Ray & 4K Video Specialists - Free UK Delivery.. It's not as though retirement has given Victor Meldrew more leisure time. He just has more opportunity to complain bitterly, to let inconsequential matters get to him, to drive his wife Margaret around the bend and to look up new illnesses in his medical dictionary... "How much longer do we have to wait? My buttocks are turning into fossilised fuel..." The Man Who Blew Away: The Meldrews play host to a suicidal stranger from the past, .. The grim reaper finally gets to Victor Meldrew. He may not arrive in the form of a strangely-shaped unordered parcel, as a workman with the intellect of an orang-utan, or even as Meldrew-fixated, ex-neighbour Patrick, but he better be prepared to listen - Victor might have a few complaints to make... The Executioner's Song: Victor's window cleaning performance is reviewed (poorly) in the parish magazine, but he does manage to find the ..